Dollhouse Miniatures by Felma J.: Mannequins by Sandy Calderon! Time For Wedding Dresses Selection! Mannequins by Sandy Calderon! Time For Wedding Dresses Selection! Since it is time to start looking for the perfect wedding dress. 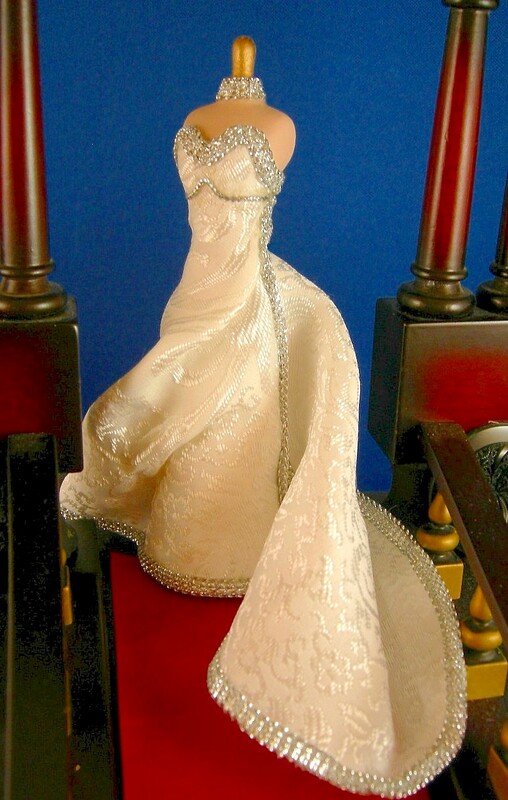 Why not dress your doll in a wedding dress using the dressed mannequin to the right as an example. Or you can use the examples below. First example is a doll named Elisa. 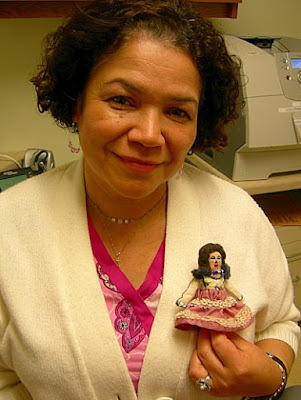 Her makers, Ruth and her daughter Elisa made this doll using a stick when Elisa was in 8th grade as a school project. Doll was to be made as a reflection of your ethnicity. I had never met Ruth until a couple of weeks ago when we were discussing how I am coping with diabetes, breast cancer, pain and life in general. I told her I had my two grandsons to keep up with and when not with them I made miniature clothes and dressed dolls to sell on eBay. She said she wished she could make something. Her daughter Elisa is now 23 years old. I could see it in her eyes that she was thinking about something far-away. Then she said she had made a doll for a school project a long time ago and was excited to let me see it. Here it is. It is a beautiful doll and Ruth I really thank you so much for sharing with me, allowing me to take picture of you and your doll. In the future I hope to see more and I would be happy to see one one your dolls entered in the contest. The making a doll contest on my blog is not about making a doll. It is about remembering the creative juices we were all born with and to never tell anyone we are not creative. Just getting up in the mornings and getting ourselves dresses is creativity. If you have a husband and kids to dress that is really creative. Having to fix lunches and dress the kids is high on top of the creativity list. Again, thanks to all of my followers and readers of my blog. I love you and may God continue to Bless America.